The zonula fibres secure the position of the lens. Dogs affected from PLL have painful glaucomas and blindness due to a dislocation of the lens due to a breakdown or disintegration of the zonula fibres. PLL can be inherited or acquired. 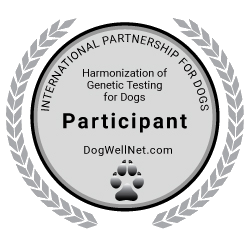 Therefore the disease might also affect genetically free dogs. First clinical signs of the inherited form of PLL are detectable at the very young age of 20 months. A complete lens luxation typically occurs at the age of 3 to 8 years. autosomal recessive; In most cases heterozygous carriers are healthy. However, it is estimated that about 2  20% of the carriers will develop PLL.